VersaHANDLER telescopic tool carriers, commonly known as a telehandlers, are popular in agriculture. But, telehandlers continue to be a smart choice in construction, landscaping and snow removal applications because of their versatility, exceptional reach and lift capacity. While telehandlers deliver many of the same functions as wheel loaders, attachment carriers and rough-terrain forklifts, they also have a number of advantages that can’t be matched by other machines. Telehandlers have a compact size and low profile, allowing for easier cab access. 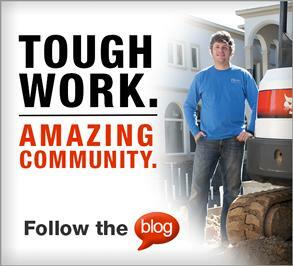 Their compact size is ideal for tight quarters, such as turning around in a driveway for residential roofing projects or traversing a crowded jobsite. Their low profile allows these machines to fit into smaller entryways, such as barns, sheds or garage doors, while the telescopic extension makes it possible to lift and reach upper levels of racks and stacks. Farmers like telehandlers for stacking hay bales six to eight rows high inside a hay shed. Their reach is greater than a tractor, and the lift capacity means 2,000-pound bales can be stacked two at a time. The lifting capacity of the telehandler also applies to shingles, pallets of sod and bundles of pipe. The extended reach of telehandlers makes it possible to safely unload delivery trucks from one side. This eliminates the need to enter the street and block traffic while unloading pallets of sod or bundles of pipe from the other side of the trailer bed. While telehandlers aren’t the only machines designed to lift and reach, they are more agile on rough terrain than other options. Forklifts, for instance, are primarily limited to level concrete surfaces. Telehandlers are capable of unloading and moving materials – mulch, rip rap, gravel – around landscaping supply yards and construction sites with ease. Their wide tires also allow for greater floatation across wet surfaces, while four-wheel drive delivers additional off-road traction. In addition, you can choose from three modes of steering – all-wheel steer for tight turning, crab steer for maneuvering from side to side or front-wheel steer for road travel. The steering mode can be selected from inside the cab with the flip of a dash panel switch. Bobcat telehandlers have operator-friendly joysticks. In addition to controlling the boom height and bucket/fork tilt, you or your equipment operators can use joystick controls for several other functions. The travel direction switch allows changing between forward, reverse and neutral gears, and the two variable switches control the extension and auxiliary hydraulic flow. After pressing a button on the control panel, use the plus and minus buttons on the telehandler’s joystick to adjust the auxiliary hydraulic flow or the speed of your other hydraulic circuits – lift, tilt and extend. The ability to interchange attachments adds to the versatility of telehandlers. For instance, a Bobcat V519 telehandler is approved to carry most of the same attachments as a Bobcat T870 compact track loader. This includes a soil conditioner, Brushcat rotary cutter, an angle broom and even a snow blade. 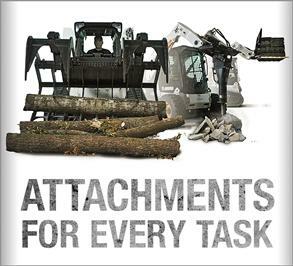 Attachments simply enable telehandlers to do more than a dedicated lifting machine. The snow blade is one of the most popular attachments for telescopic tool carriers behind the bucket and pallet fork. The machine’s travel speed and low profile allow it to quickly crisscross parking lots, clearing the snow and piling it high. By adding an angle broom, the telehandler can clear driveways, streets and parking lots of dirt and other construction debris. 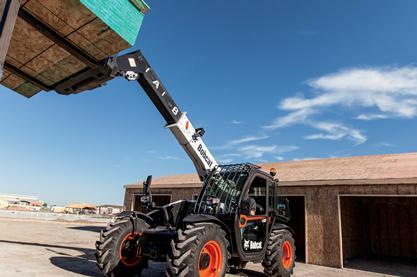 Lifting pallets of building material to a first- or second-story building can be simplified with a pallet fork attachment for the telehandler. And when other tasks need to be completed, a telehandler can fit the bill. One example is using the telehandler with an auger attachment, helping you dig holes for fence posts quickly and efficiently. 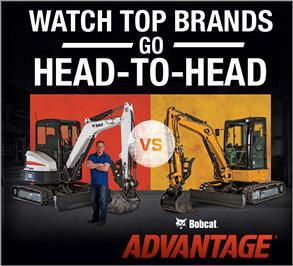 Bobcat V723 telehandlers come standard with a hydraulic quick-tach mounting system. This is similar to the attachment mounting system found on skid-steer loaders. With the hydraulic quick-tach, you or your equipment operators never have to leave the cab when hooking up, changing or disconnecting non-hydraulic attachments, such as buckets or pallet forks. With their compact size, lift capacity, maneuverability and attachment versatility, there’s little that telehandlers can’t do. Adding one to your fleet can help you take your business to new heights.